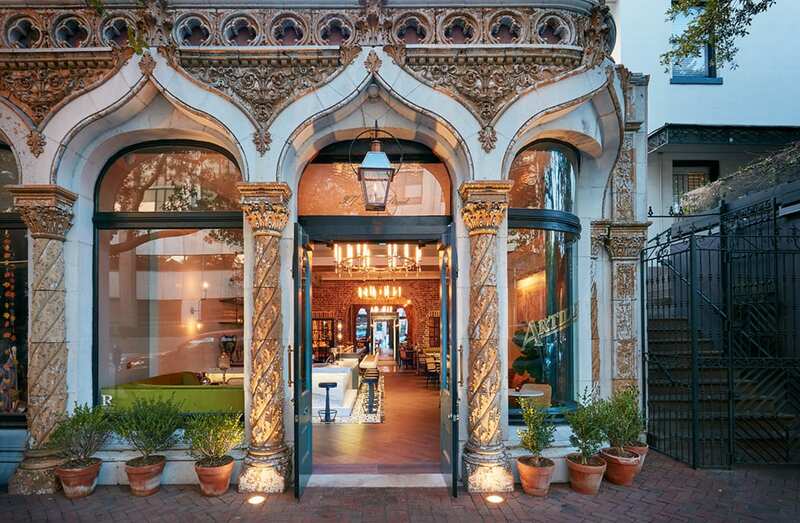 The ornate facade is one of the only elements that is original to the 19th-century building that houses Artillery Bar in Savannah. | Photo by Jeremiah Hull. 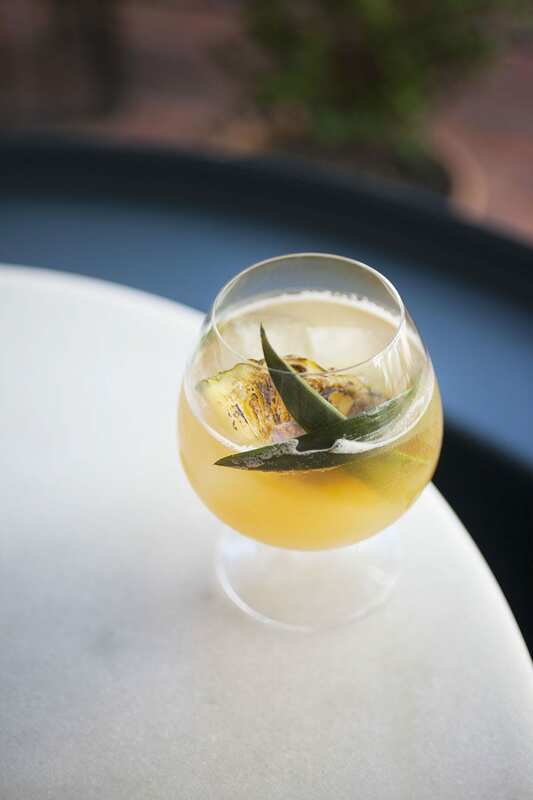 La Nina Fresa combines Plantation Pineapple rum, housemade tepache and lime juice. | Photo by Amanda Driggers. The designers aimed to strike a balance between modern and historic elements. | Photo by Jeremiah Hull. Wines on tap share billing with creative cocktails at the bar. | Photo by Jeremiah Hull. 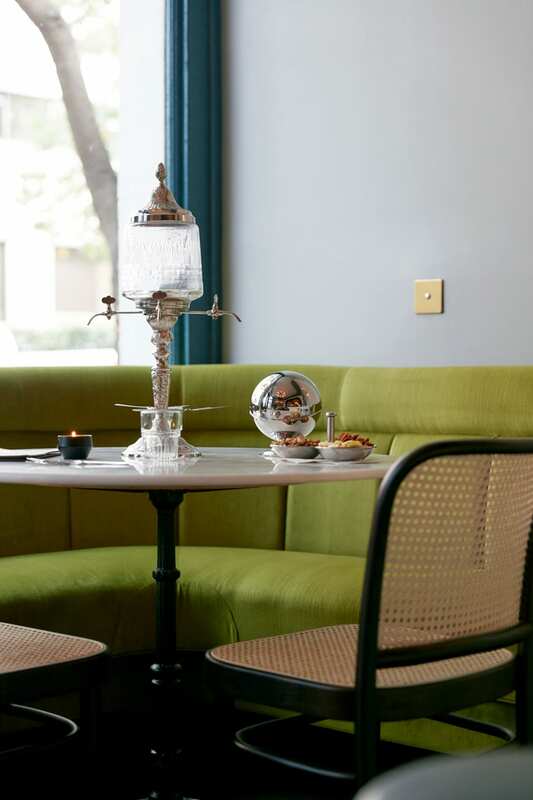 Chartreuse velvet banquettes were installed as a nod to the building's former automotive tenants (to resemble the upholstery in vintage cars). | Photo by Jeremiah Hull. 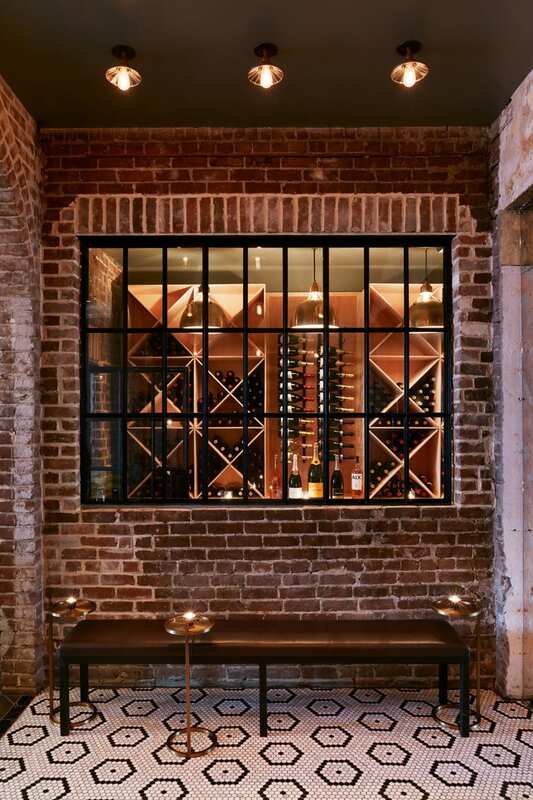 "I didn't want people to think it was a historic speakeasy that had been there for 200 years, but I didn't want to create a super modern space inside a historic shell either," says Daniel Reed Hospitality creative director Robby Perkins. | Photo by Jeremiah Hull. 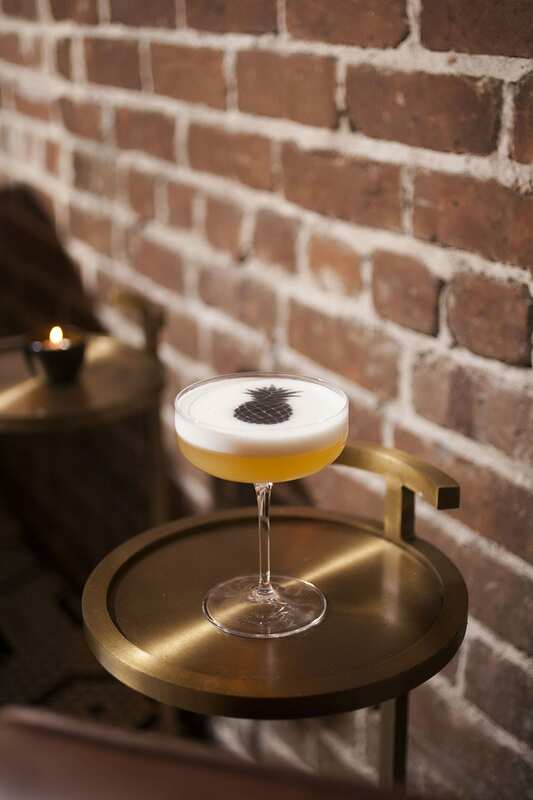 The Gilded Labyrinth cocktail features Plantation Pineapple rum, coconut tea-infused rum, tepache, banana liqueur, lime, pineapple vinegar and egg white. | Photo by Amanda Driggers. Thanks to plenty of clean lines and subtle design decisions, every inch of the bar exudes elegance. | Photo by Jeremiah Hull. 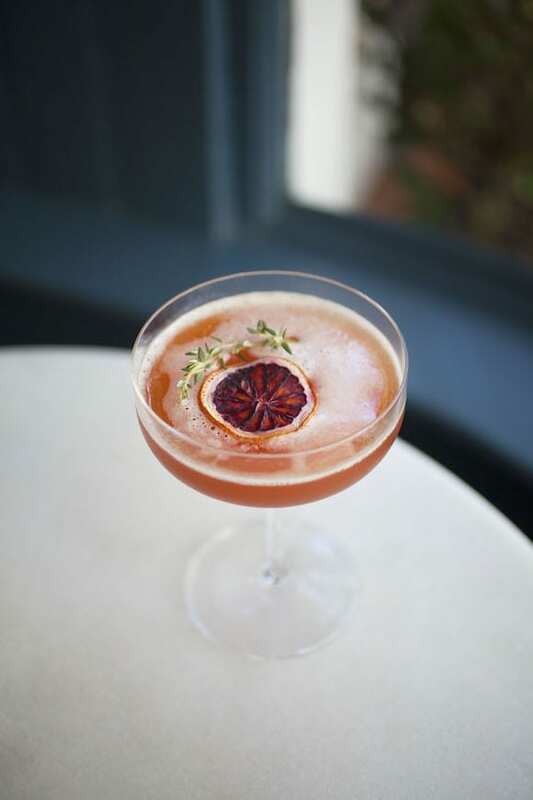 The Bloodline is a fruit-forward take on the Pimm's Cup with gin, Pimm's No. 1, blood orange juice, watermelon, lime and thyme syrup. | Photo by Amanda Driggers. 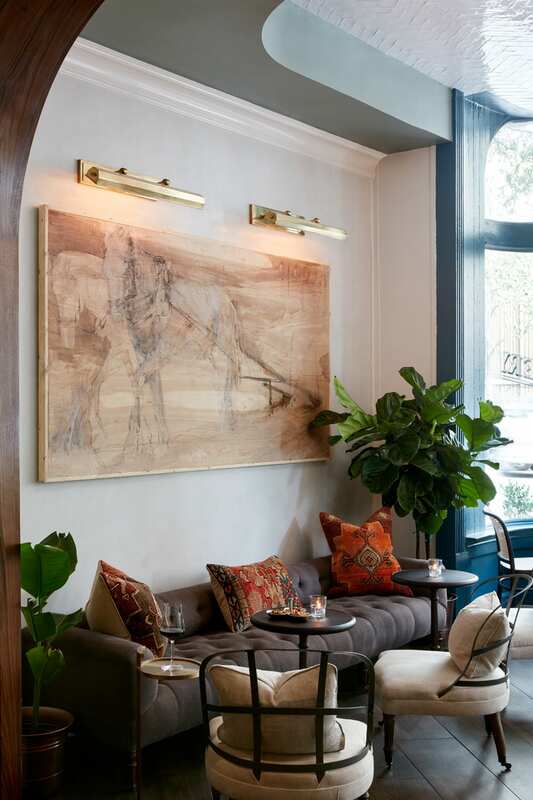 A custom panel by local artist Mary Hartman—an abstract of a horse pulling a cart—is a defining element of the main room. | Photo by Jeremiah Hull. If the walls of Savannah’s Artillery Bar could talk, they’d have volumes of history to relay. Once home to Savannah’s volunteer militia group the Georgia Hussars, the 19th-century building that anchors 307 Bull St. had many other lives before a cocktail bar filled the space in 2016: artillery storehouse, retail space, automotive showroom and year-round holiday goods store. Today, the gilded Artillery Bar seems perfectly at home in the space. 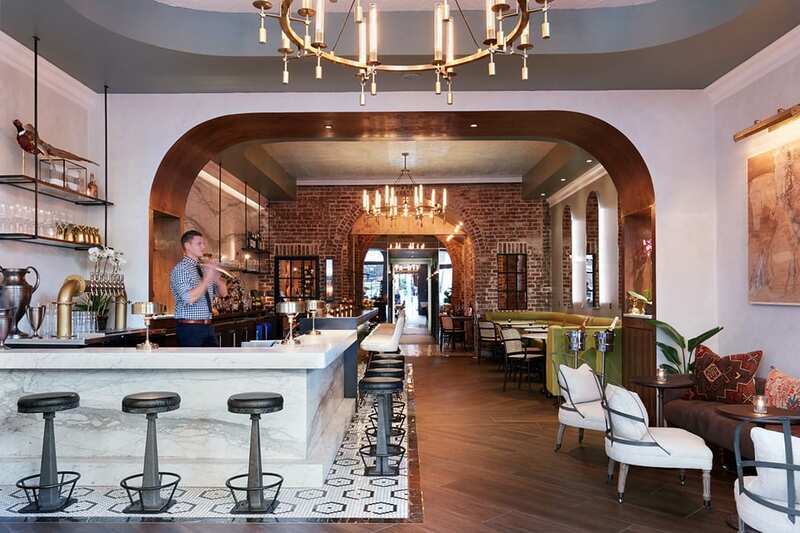 “I didn’t want people to think it was an historic speakeasy that had been there for 200 years, but I didn’t want to create a super-modern space inside a historic shell either,” says Daniel Reed Hospitality creative director Robby Perkins. Honoring the history of any building while updating the interior to feel current can be challenging, but that’s the balance Perkins and team managed to strike with Artillery. 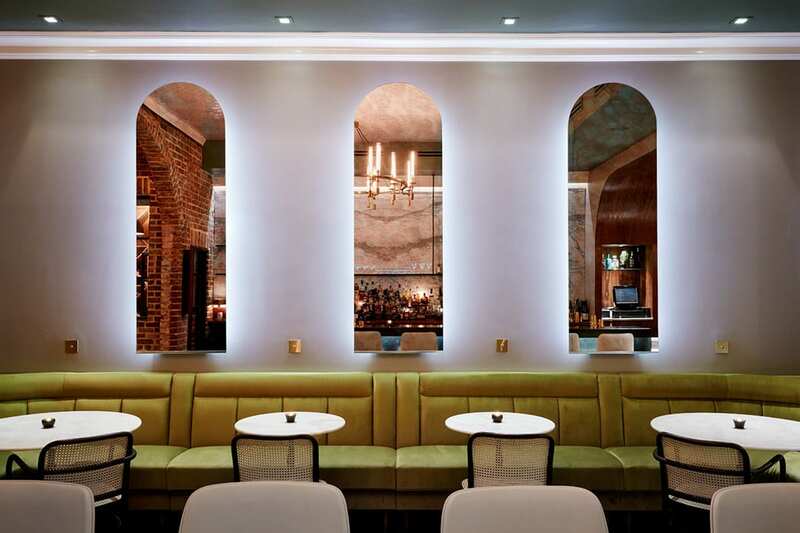 “The building was an automotive showroom at one point, so I used that to inspire the design for the chartreuse, velvet banquettes (to resemble the upholstery in vintage cars). The paneling and horse reins in the back hallway leading to the restrooms nod to the horse stalls that used to occupy the back of the building, when the cavalry kept their horses there that pulled the artillery,” he adds, citing a custom panel by local artist Mary Hartman—an abstract of a horse pulling a cart—as one of his favorite elements in the room. 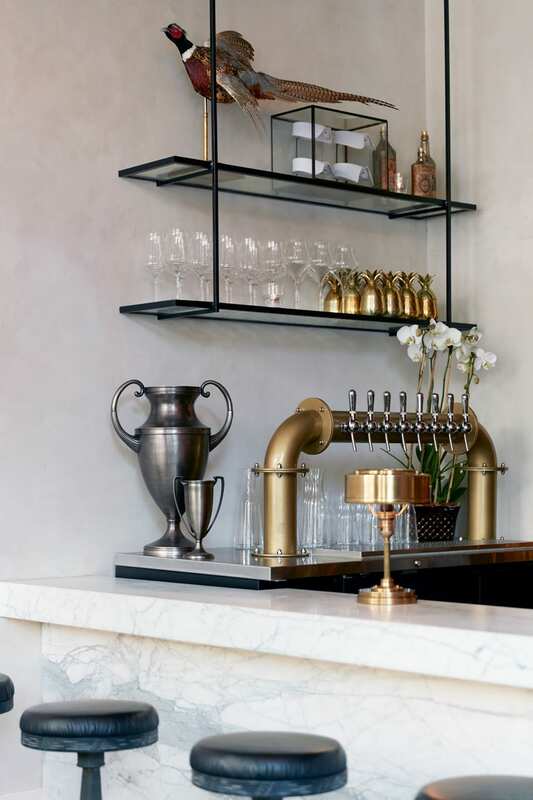 From the building’s ornate facade to the modern light fixtures and bright marble countertops inside, every design element speaks to the Artillery Bar’s unique character. “Because it was a small space, it allowed us to do some impressive finishes and installations that might not make sense in a larger buildout. There’s something special about it. Everyone feels that just walking by the place,” Perkins says. Previous articleAre Field Blends The Key To Mezcal’s Future?